This is the second installment of a two-part series about gold as an investment for your portfolio. The two posts may appear like a candidate's debate or popularity contest, but they really aren't. Our purpose is not to win an argument in either direction — it is, simply, to provide you with both sides of an issue which doesn't have a clear-cut best side (no matter what people may try to tell you). Our hope is that this format provides you with sufficient information to make an informed decision. Yesterday you saw the reasons why gold should not be part of your investment portfolio. And those reasons are valid, but (and you knew there was a “but” coming) before you shut your mind to the notion of owning gold in some form, you might want to ask yourself: How come, if gold was such a terrible thing to invest in, is it by far the oldest, and most consistent investment of all in the history of humanity? Times change appetites, and so it is with the investment flavor of the month. Dig back through the musty archives of human history, and you will discover that no other investment has stood the test of time like gold. None. As Robert Brokamp mentioned yesterday, there was a time when the latest wisdom said that tulip bulbs were a better investment than gold. And, indeed, for a short period, they were. In the long term, well, you know how that turned out. From the traders in the time of Hammurabi to Genghis Khan and Marco Polo, the universal investment vehicle has always been gold. We have roughly about 6,000 years of recorded human history — and gold has been a part of all of it. Compare that to the stock market as we know it, which is barely a hundred years old and still wet around the ears, relatively speaking. And if you think the stock market is young, mutual funds are like kids in diapers running barefoot around the yard. Index funds are the infants in the group, being even younger than mutual funds. Tulips bulbs and mutual funds may not be around a few decades from now, but gold will always be there. That's not to knock the investments we take for granted today; millions do well with them every day (and you can count me among that number). All I am saying is be careful before you totally dismiss an investment that has proven itself over a far longer period of time. No matter which country you go to, gold is immediately recognized as valuable. Take out a few pieces of gold in a rural village in Tibet or Tanzania and you're in business. Try that with an index fund, or even your dollars, pounds, yuan, yen, or rubles. At its core, investing is simply shopping: You shop for things to buy in the hopes they will increase in value and/or give you money every year. The difference between investing and shopping is that, at some point, you have to sell the investment to buy other things. Nobody can predict the future — let's just get that out of the way — but it is good to know that when it comes time to sell, your investment has been in universal demand for as long as humans have recorded their history. For what purpose do you invest? A rainy day. But, when the days get rainy, what happens to most investments? They tank … just when you need them most. Gold, for reasons nobody has been able to fathom accurately, is the investment of choice around the world for those who are preparing for a rainy day. Rainy days are not confined to recessions. Something like the oil embargo of 1973 brought unprecedented change to America. Gold was the only investment which offered safety during that crisis. Not to be an alarmist here, but domestic upheaval or major war is always unthinkable … until it happens. In just the last hundred years, we've seen not one, but two world wars. On top of that, many countries have undergone major changes in government, even revolution. Not long ago, peasants looted the wealthy in two of the largest countries — Russia and China. It still happens in other parts of the world. Those are not just arcane lines in a dusty library history book; there are many people alive today that experienced those events when they happened. If you are inclined to scoff that something like that will never happen here, consider this: Social upheaval always follows unusual and indefensible shifts of wealth from the poor to the super-wealthy. 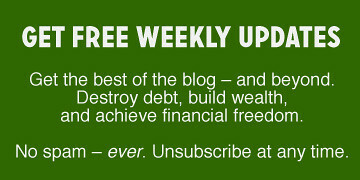 Again, I am not suggesting this is going to happen to you; but, do you think that America's run-away debt — like those in other nations, such as Greece — will leave the money world as we know it unaffected? If anything happens to paper money systems anywhere, gold alone has proven itself as the safest of investments available to the mortal man … for thousands of years. No other investment can make that claim. Even real estate bombed in the Great Depression. Heaven forbid that you should have to change countries; but even if you just want to, there is no better means of taking your wealth with you than gold. This type of circumstance can be as dramatic as the Russian pogroms which forced Jews to flee in haste or as mundane as your wanting to spend five years traveling the world. The only instrument of wealth most people took (literally) with them when they faced similar events was their gold. Again, you may argue that this situation doesn't apply to you, and you may be right. But what if you simply want to move to Belize or Mexico because their cost of living is much lower, they don't force you buy overpriced health care and, well, whatever reason you regard as important? You may have access to your mutual funds … but then again, you may not. It is important to realize that those links to investments can be severed at any time when life-changing events like those examples unfold. Gold has outperformed stocks — so far. Those are the facts in black and white (or Bronco colors, my favorite). I am not playing games with dates because I am just trying to find the truth myself (as an investor). Therefore, I went with the longest period possible to provide all of us with the best idea, objectively, of how gold performs. And, frankly, I was surprised to see how good it was. The second argument scoffers respond with when they see gold has outperformed stocks (and, by inference, the mutual funds based on stocks) is that the past is no predictor of the future. And technically speaking, they are correct of course. But the same applies to whatever else they tout as well, and … what else can we use? None of us can predict the future — nobody. Yet, by its very nature, investing is all about the future. We need to make investing decisions for the future, which we cannot predict. The only alternative to history as a decision base is a story of some sort, such as, “I believe developing countries are going to grow” or “an index fund will offer the best return with least risk.” The people who say those things may believe them passionately, but upon what are they actually based? The past and some story. Whether you are Warren Buffett or Joe Shmoe, we all make decisions based on some measure of fact and fiction. The past is the fact, and the story about the future is the fiction. We all do it — none of us are superior in some way to be able to tell the future. 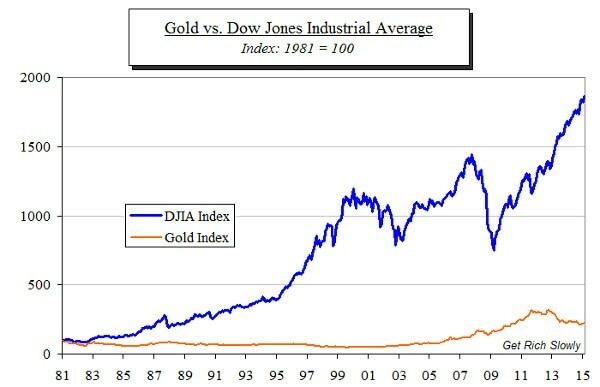 And the fact is that gold has outperformed the Dow ever since it was set free in the early '70s. You have to add your own story about its future. When all is said and done, I make more money from my investment efforts than from my writing pursuits. Therefore, I look at this question from my own perspective: Should I have gold in my portfolio or not? I really couldn't care less if I win or lose the argument; it sincerely comes down to wanting to know what the best investment is that I can make for my (not so long anymore) future. For decades, I was a scoffer. I passed on anything to do with gold, despite that I came from the country whose entire economy was built on being the largest gold exporter in history. Personally, I will never sell everything else and just buy gold; but to totally ignore gold as an investment is, I believe, no longer prudent. As with any investment, I will not choose an entry point near a peak, but gold is not at a peak right now. The whole idea behind an investment portfolio is that you can't know what the best investment will be for the future, so you pick a half-dozen or so of them in the belief that some will shine when others stall. Gold, I believe, should be one of those elements in everyone's portfolio. And isn't that what the titles of the two posts asked? Again, the reason we wrote these two posts back to back is to give you the opportunity to hear both sides of the gold-investment argument, as it were. The future is unknown, and none of us can know which choice will turn out better. But each side has its merits, and each side's supporters have their beliefs — some held with great passion. The object, though, is not to win with words or votes, it is to help you understand the pros and cons well enough to make an informed decision about how to get the best return on your money. What do you think? Has our discussion helped you solidify your position on gold as an investment? Should gold be part of your portfolio? There are 48 reader responses to "Why gold should be part of your investment portfolio". Its always a good idea to hold a portion of gold in your portfolio because it acts as protection when markets take a dive like we saw in 2008 and 2000. Gold will always remain part of my portfolio. The gold sold in 2001 was at its lowest since 1978. In other words, if you needed to sell because the market was down you would have lost money on any gold you had purchased in the previous 23 years. Why are you so against gold? It sound like you’re almost scared of it. I see nothing wrong with having some gold and silver if you like. I actually don’t think it’s a great investment but certainly not a bad one. I still think most people buy gold and silver for “when the markets crash”. Yes, it may sound far fetched but with the way the economies of the world are now you never know what can happen. Even with that, you would need to get rid of your gold before things really got bad. I myself have a bit of gold and silver but also have much more money elsewhere. I would never say never when it came to any sore of savings. I am not “against gold”. I have a gold wedding band. But selling it as an “investment” is a fraud. It is entirely a speculative gamble. If you want to create some of that kind of excitement in your life a lottery ticket would be a better “investment” right now. The only way someone makes any money on gold is if someone else loses money. If you include transaction costs, its a lot like Vegas where the only sure winner is the “house”. In this case, the “house” is often those folks promoting gold as an investment. Yes, I agree. I keep 5% of my retirement fund in gold as well as 10% real estate and 10% natural resources and 10% Long Term Treasuries. The rest is in Index and Growth Funds and so far I am beating the index this year. I don’t think people invest “for a rainy day” but for retirement. So it’s not highly probable that the market will tank just as you decide to retire. It’s possible but not likely enough that you have to base your stock choices on that assumption. Thanks for providing the graphs; they certainly make a good case for including gold in the portfolio. Sorry, not buying it. Many of the arguments here are based more on emotion and hyperbole than logic. I also think the author is confusing gold as an investment versus gold as a currency (historically), and doesn’t consider different types of investments in gold. Some of the advice seems contradictory — buy gold because you can take it with you — no wait, buy gold in an ETF. Buy gold because it’s safe because people have been looted in the past — but if that happens to you, that gold bar you’ve got hanging around the house is going last long, isn’t it? If it’s in a bank vault, how do you plan to access it and keep it safe? No one so far has been able to answer how you can use a bar of gold during a crisis — carve off bits to pay for things? I know I’m being critical, but we should all be critical when it comes to our investments. We should read between the lines and poke holes in arguments. I’m curious about an ETF as the author mentioned — perhaps GRS will follow up with an article on the different types of investments in gold? Spot on, Beth. Buying gold for a rainy day/crisis makes little sense. If you want to be protected in the event of economic crisis, pay off all your debt, own your home free-and-clear, and have a food storage. A gold bar will do little to put a roof over your head and food on your table. This argument goes back to “what do you know about gold”? So you said scraping off gold, have you heard of denominations? If you want an accurate graph, don’t use the pegged price as a starting point. Just go one month later after asset prices have equilibrated a bit. That number is $80/oz and would make your charts look much, much worse. Gold’s “fall back investment” and “inflation hedge” are purely emotional plays. While a rural Tanzanian villager might recognize gold as valuable, it is because he believes he can exchange it for something else valuable, denominated likely in a government currency. Put another way, people flock to gold irrationally believing it will have value against inflation, and their flocking makes it appear as though it does. Still, unless you can eat it, burn it, build something with it, or otherwise actively use it as a commodity, it is no more “real” of a value than paper currency. It is worth only as much as someone will bother to exchange for it. Historically, its convenience made it a good metal for coinage, so it had value AS CURRENCY, not intrinsically. If I wanted a hedge on inflation, I would look to companies that mine rare earth minerals. They are susceptible to economic shocks, certainly, but we absolutely need rare earth minerals at present to make our gizmos go, so they are a commodity with rarity and need. And if I’m doomsday prepping (silly, admittedly), nothing beats food, water, and survivally durable goods. After all, you can’t eat gold. I like two of your points but take issue with the third. You are right that dooms-dayers would be better off stocking usable items. And you are right that, “[Gold] is only worth as much as someone will bother to exchange for it.” I like your point about inherently useful items. But gold being just another government CURRENCY is way off. As you mentioned exchange and rarity are keys. Currency can be printed or created at will by the government, the fed or the banks. Every nation so far has inflated their currency; and thereby stealth-taxes their citizens. But gold has some inherit rarity. The government can’t just print it or add zeros to their accounts. This is VERY different then a currency. And prior to the 1930’s it put a real check on government excesses. Well, the gold chart had two major peaks. One coincided with a period of double digit inflation when everyone was running to gold and driving the price up, and the other corresponds to the recent recession again, everyone running to gold for security. Otherwise you were pretty much sitting flat between 1972 and 1978, six years, and then 1982 to 2004 or so, or 20+ years of flat after that. I’m a bit torn on this. I have a 2 million and a 5 million deutchmark note from the German economic collapse in the late 1920’s or 1930’s prior to WWII sitting in my desk drawer as curosities and reminders that paper money is only as good as the Government backing it. People don’t really understand how close or bad things got during the recent recession, and having an amount of gold would have felt “good” during that time. But is that worth putting a bunch of my assets into something that could flatline for over a decade before we hit an economic scare even given the markets have rebounded through those scares? Since I facilitate retirement planning seminars around the country, and have never sold any type of investment products (no conflict of interest), I think I have a feel for who the average investor is, and I assume most of the people accessing this website fit into that category. The average investor has historically received significantly lower returns than the stock market average, because of their behavior being impacted by fear and greed, resulting in buying high and selling low. Gold feeds those same behaviors, which is exactly why I support most conservative financial experts who don’t recommend gold for the average investor. Huh? So a pimp can offer an unbiased opinion on prostitution because he hasn’t offered his personal services? I don’t know how gold is any different with regard to greed and fear compared to any other investment. I have attended a couple of seminars and while I usually learned something I have stopped attending them. The main reason is that in most seminars I visited at least half of the attendees are non-average non-investors resulting in lots of time waisted on questions like: “All the advice you give is dependent on having capital. Could you please explain how I can invest without having any capital?”. Or this gem I heard two years ago: “I have decided to invest my money in a new sports car, as I believe that investing in stocks is gambling. Which brand and model do you think will go up in value most?”. I trust the seminars you facilitate will be of a better quality, but I somehow can’t get rid of a feeling of doubt that they include the average investor. I do not know the solution how to avoid that large groups of people buy high and sell low. I am no brilliant investor and make mistakes on a depressingly regular basis yet I make a decent profit. Usually with boring dividend paying stock which I keep for a long time. The mistakes mostly happen when I buy exciting stocks with lots of promise. This is a great post. I have lived outside the US since 1998, with the exception of Grad school,and a few short breaks. It amazes how other cultures value gold. When I was in South Sudan,I was conducting an interview with a young women in her twenties. Out of no where I asked here, what is money? She responded money is something that has and keeps value over time. Like what? She went on to say Gold and Cows.I burst out laughing. She was Dinka, and cows are certainly wealth to the Dinka and the bride price, but she went on to say, gold was more portable and that families who could purchase gold, bought it, and hid it (gold) because her country had been so unstable for about 30 plus years. In Serbia, my girl friend’s mother told me of people pulling the gold fillings out of the dead mouths during the war. In Afghanistan, where I sit now, the Pashtuns in both Pakistan ( I also lived there)and here in Afghanistan have a saying Zan, Zar and Zamin, it tranlates to Women, gold and land. And you had better never touch a man’s Zan, Zar, or Zamin. Blood feuds last hundreds of years because of this. Men that can afford it, buy their brides LOTS of Gold from Dubai. And this my friend is why I will always hold 25% Gold, 25% Stocks, 25 Cash, and 25% stocks ( Index) funds. This portfolio has returned 9+ percent every year for the last 40+ years on record. I can live with this position,and so should you. Living in these unstable environments has taught, you NEVER know what can happen. There was a time in the 70’s when the Serbian passport was more widely accepted than the US passport, look at her now. Look at Greece,and Spain, and Portugal,and Italy, all world powers at some point,and Spain and Portugal both held the World’s Reserve currency for a time. History is littered with examples of why you should hold gold. I appreciate the articles, and I don’t see harm in having some investment in gold. If we’re using possible government collapse as a reason for investing in gold, then I would submit that a better investment would be lead; as in, bullets. If society collapses, the only things I care about are access to food, water, and shelter, and the means to protect them. As the person who wrote the “anti-gold” post yesterday, I have to give kudos to William. When we were planning this, he knew he was taking the less-popular side of the argument, but he did a fine job with it. This is not a popularity question. His article is misleading and inaccurate. Please explain where you think the article is misleading or inaccurate. That would help a useful discussion. The DOW Jones ended 1972 at an historic high level that it didn’t reach again until 1982. Gold prices were never again lower. 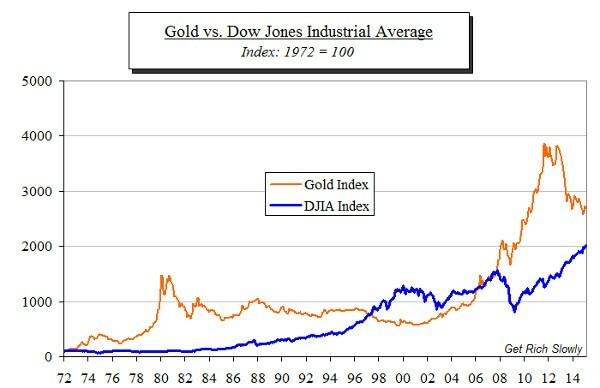 The graph shows how well you would do if you had bought gold low in 1972 at a historic low compared to stocks at a historic high. If you compare the two in all the years since, that 1981 graph is a lot closer to the typical result. That doesn’t even take into account that current gold prices are likely still in a bubble. Your typical return if you bought and sold over the last 43 years would be closer to zero. Its only in the last decade that you would have had a positive return. The other thing is that the graph does not take into account compounded dividends. The DOW was at 1000 at the end of 1972 and is at 18000 today. Your graph reflects only that increase, it doesn’t begin to reflect the compounded value of the dividends over that period. If you used the dividends to buy stock, it would increase the overall returns from stock appreciation in addition to increasing the dividends received. Clever goal posting. The graph starting in 1981 was slightly down from the previous year’s historic high for gold. The graph starting in 1972 was a historic high for the S&P500. The S&P had just gone up over 40% in previous the previous three years and then fell the next two years. Its really the only point in time where you can show a net gain for gold over the market. The question is not what stocks or gold are worth today. Its what they are likely to be worth when you sell. If you manage to sell your gold in the brief periods when lots of other people are buying, like right now, then you can come out pretty well. If you are one of the buyers during that period, you are going to lose your shirt if you have to sell at its normal price. What the graphs clearly show is that the opportunities to sell gold at a profit have been pretty limited. Right now appears, based on its history, to be the wrong time to buy gold, but a great opportunity to sell gold if you own it. Of course, sellers need buyers and there is a lot of misinformation out there to juice people into becoming buyers. I have my own personal perspective on the issue. I have lived for 10 years in Germany. Some of my older friends over there have been forced to switch to new currencies 3 times in their lifetimes. Only the switch to the Euro did not result in a big personal loss to them (but it still might!). It makes you realise that paper money is nothing more (and nothing less) than a promise from a government. Gold on the other hand has a value independent of any government. Gold is not an investment as far as I am concerned, but as a long-term store of value it can not be beaten. A bit of gold in a diversified portfolio doesn’t hurt and for me seems a sensible and cheap insurance. If a person were to want to buy gold that could physically be on hand, what is the best way to do it without paying huge markups for coins? You could invest a thousand bucks in a very good metal detector and go around the old gold fields or on the beaches. A fun hobby, good exercise and you will find free gold. It is surprising how many people lose gold rings at the beach. Slippery sunscreen on the skin and shrinking fingers because of the cold. Great question. IF you agree with getting gold. IF you want to take possession of physical gold. I would suggest you not dismiss coins. When you take precious metals out of the system and try to sell them back into the system people get nervous. There has been a great deal of fraud in the last decade. Even a few of the reportedly reputable sellers have been caught selling “gold” bars with lead or other metal cores. As a result, if you want to sell your gold, you will have to pay someone for the cost of having it checked out verifying its weight and purity. This process is called assaying. Unless you are a big dealer you (the seller) will be charged for the assaying cost to verify your gold. There are other options; 1) keep the gold in the system so it always has provenance, or 2) sealed jewel boxes with certificates of authenticity, but they have problems, too. The cheapest gold (low price over spot) is bars. They are easy to make. But when you sell them they will have to be assayed. Coins on the other hand are thin wafers with government guarantees of purity and weight. It is very rare that people will bother to fake a bullion coin when they can make more money, more easily by faking bars. Further, when you sell back the coins there is no issue with assaying so you avoid that cost. They come in smaller weights than most bars so you can sell off smaller proportions of your portfolio. But don’t go too small or the cost over spot gets too high. (Ex. Right now, 1oz American eagle is ~$50 over spot, 10– 1/10oz American eagles are ~$178 over spot for the same amount of gold via APMEX) Stick with 1 ounce American eagles or Canadian maples. If you’re the kind of person who can’t stand paying over spot for a precious metal, consider “junk” silver. These are normal everyday coins that were in everyday circulation prior to 1964. They are made of 90% silver and are the cheapest you will ever find a precious metal over spot. Just make sure your family doesn’t end up spending them like normal money. It’s great that you took the time to try and explain gold investing pro’s and con’s, however you missed the mark with your ETF. People need to understand that physical gold is a store of wealth and ETF is price speculation just like any other stock market investments. Four of the five reasons you wrote about for “investing” in gold are negated by purchasing an ETF. This is likely a very dumb question, but do the charts posted account for dividends? No, it is a very good question, as it is not mentioned anywhere. 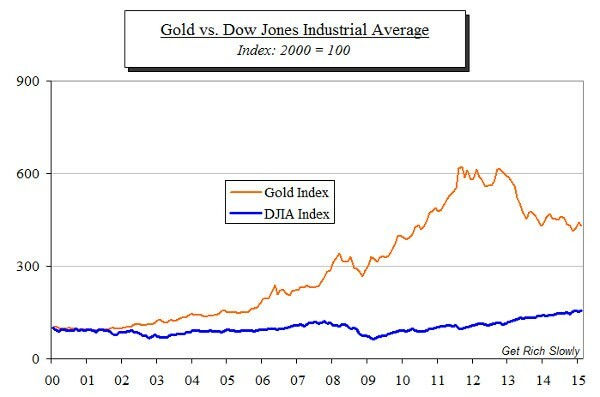 The DJ charts do include dividends but not taxes and costs, the gold charts obviously do not include dividends. You should be clear about just how misleading that graph is. First, gold doesn’t pay dividends. Stocks do, at somewhere around 2 or 3% for the S&P. That should more than double the return on stock when compounded. Actually at 3 percent, its closer to 4 times. Second, the graph actually shows the relative value of stock bought at 1972 prices with gold at its 1972 price. It tells you nothing about the relative value of stock bought compared to gold at any point since then. The price of gold had been floating since 1968 (http://www.nma.org/pdf/gold/his_gold_prices.pdf) above the official US exchange rate. The US suspending actual redemptions in 1971 which is, in theory, why he started with the price of gold at that point. But in 1972 the average price of an ounce of gold was still only 58.42. By the time that “temporary suspension” became permanent in 1974, the price of gold had risen to $154. In 1972, the S&P index was 1.41 times its 1970 price (http://en.wikipedia.org/wiki/S%26P_500). By 1974 it had fallen to .89 its 1970 value. In other words an ounce of gold could buy you 41 S&P shares in 1972. By 1974 it could buy you 173 shares. That means the value of those S&P shares today relative to an ounce of gold would be over 4 times the value the graph shows. In fact, that 1981 graph he claims is misleading is similar to any graph starting after 1972 and before 1997. As long as that gold line is above the blue line, you could buy more stock with gold than you could in 1972 and the value of that stock would be proportionately higher today. My claim about the effect of compounded dividends in this post is exaggerated. In simple terms, if you consider dividends as interest, their value would be four times the value of the initial investment, not the stocks final value. The actual effect is far more complicated, since dividends get adjusted as the value of the stock goes up. Bill, Bill, Bill . . .
Gold is Las Vegas and not an investment. Dave Ramsey agrees with this position too. All that glitters is not gold! Is the Dow Jones graph with dividends reinvested? This was absolutely absurd. Speculate in gold (because it’s certainly not investing) if you are foolish and easily manipulated by emotionally-charged rantings and ravings about inflation and governmental collapse and enjoy exposing yourself to needless risk for below-average returns. Both William Bernstein and Allan Roth think that having a tiny amount of gold (precious medals equity) in the portfolio as a hedge against inflation is not a bad idea. It’s certainly not for everybody and they admit that you may never make any money from it, but they don’t say it’s a terrible idea. Bernstein recommends taking any profits whenever you can. Gold will only be good if you have in physical form If you have to leave in a hurry or the stock market crashes Having it on paper is like not having it all. If you can’t access gold quickly, there really is no need to have it. If financial collapse happens, you won’t be able to get your money out of a bank, let alone get real gold from paper. If you are investing in gold, better find a good hidey hole for the physical stuff. And then you will want it in small amounts, heaven forbid you trade a gold bar for a loaf of bread and get no change back. Wow. Just discussing gold seems to get peoples blood going around here! Wonder what it is about gold that gets people all excited? Is it because since antiquity gold has been recognized all over the world in all cultures as something of value? I have a question to all gold naysayers. You say lead is worth more than gold. Fine. If I have a pound of lead, will you trade me for a pound of gold? ;) All sarcasm aside I still think gold is fine to hold as an INSURANCE part of your portfolio. 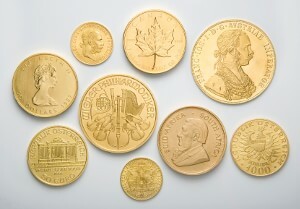 Holding some physical gold coins is just like having “money in the bank” as it were. Just my two (copper) cents. And no, I am still not Rush Limbaugh. Cheers! How is it like that? I really don’t see it. It seems to me it is more like having a house or car where you have to find a willing buyer to transform it into money you can spend. I can write a check on “money in the bank” or use my debit card. Well, it seems like we will agree to disagree Ross. The phrase “Good as gold” holds no meaning to you and the other anti-gold zealots on this post and the fact that gold has been a element of extreme value for thousands of years don’t mean spit in your view. Nuff’ said. Cheers! Don’t sell yourself short. Historically, about 150 grains (0.31 tr. oz.) of lead will get you all of the gold that the other person has. That’s a way of looking at it I hadn’t thought of! :) Cheers! We are living in Hong Kong right now, and I can tell you this much, the Chinese value gold, and they have for generations. Rich or poor, this is definitely an investment for them. You can go to any jewelry/coin store and it will be filled with people buying. It is a traditional gift to be given at weddings. I asked a local friend about it once. She said that no one really trusts banks/markets/governments, but that gold is something physical that you can keep with you. Overall, I have never seen any culture save and invest the way these people do, and they also value education and don’t expect anyone to pay for them to go-they will pay full price. Not giving my opinion one way or the other, just stating some observations about a culture that is getting richer everyday. Gold as part of a portfolio can make sense. I don’t own any now, but I’m considering it. In the past gold has done well when the markets are fearful. It may not make sense but it happens, so having a little gold can smooth out your returns. I had not thought about it before, but you make some great points on why gold is good for your portfolio. Your point about gold being portable is particularly interesting. After all, nobody likes to move countries, but if you have to then gold is easier to transform into that country’s currency than another’s.